When I first heard about the Cookie Cupboard a few years back I was floored. All of the Girl Scout Cookies are stored in some magical cookie cupboard. It sounded too good to be true, but it is true. It really is. This year's Cookie Cupboard will run from Tuesday, March 16th through Thursday, May 6th. As in years past, each of the five boroughs has their own cupboard. Here are the dates and times for each--note, as of today the Bronx council hasn't settled on their location and times. No appointment is neccessary, you can buy just one box or several cases. If you are planning on a larger order (think a couple cases or more) it is best to phone in advance. I'll admit my first time visiting the cookie cupboard I was expecting a Willy Wonka-ish experience wandering around a room filled to the ceiling with Trefoils, Thin Mints and Tagalongs. Alas, when you go up to pick up your cookies they don't actually bring you back to where the cookies are stored. You just wait in the reception area and a Girl Scout Council employee will bring you your treats. Cookies are $3.50 per box. Bring cash. 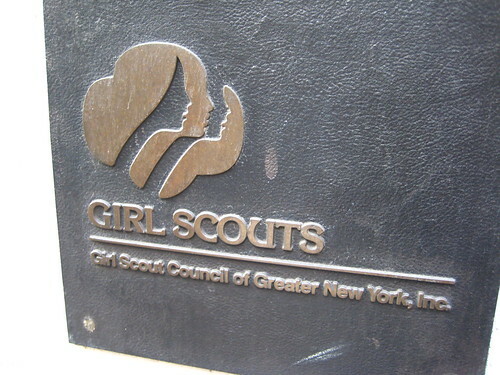 The money collected from the Cookie Cupboard goes back to the NY Council, not a specific troop. If prefer your cookies by mail and you want to order 12 or more boxes you can fill out this form and have the cookies shipped to you for $10 per case. Orders must be in by March 8th. For those of you in tax mode, according to the Girl Scouts site the purchase of Girl Scout Cookies is sort of tax-deductible depending on the situation. * The cookies ARE NOT tax-deductible, if the customer keeps the cookies: "Individuals who buy Girl Scout Cookies and take the cookies home, or consume them, have purchased a product at a fair market value. For this reason, no part of the price of a box of Girl Scout Cookies used in this way is tax-deductible." * The cookies ARE tax-deductible, if the customer leaves the cookies with Girl Scouts. 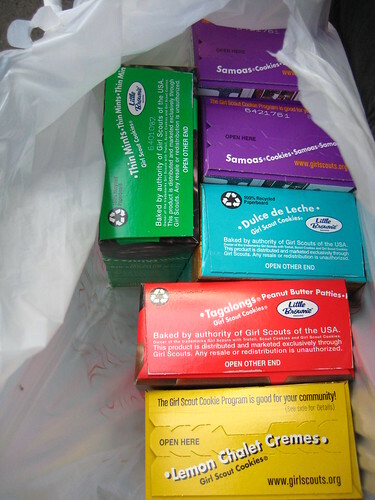 Many Girl Scouts ask customers to pay for one or more boxes of cookies for use in their community service project, for example, collecting for a food pantry. The customers not receiving any Girl Scout Cookies do not benefit directly from paying for them. Those individuals may treat the purchase price of the donated cookies as a charitable contribution. Purchases made for "Operation: Cookie" a Girl Scout initiative to get cookies to our troops overseas are 100% tax deductible. If you don't want to buy cookies for yourself, consider buying up some boxes for soldiers serving overseas. Girl Scouts will take care of the shipping and delivery. Pretty sweet deal. I'm a frequent reader of your site - and I love it. I wanted to clarify though-because this cookie cupboard sounds amazing- do I only have the option of getting a single solitary box or a whole bunch of cases? Or can I get, say, two different individual boxes, one of tagalongs and the other of samoas? The latter option seems to be the most reasonable, but I wanted to make sure. Thanks! Thanks for the compliments, Liz! Once the cupboard is open, you can go get different combinations with different amounts, like I did last year (the photo at top). Thanks :). I can't wait to get my hands on them.